Every year around this time I make one of my favorite fall recipes with the pretty squash I’ve used to decorate my house. The centerpiece takes center stage in one magnificent dish with all the flavors of Thanksgiving–sage, apples, pecans, cranberries, squash, toasty bread stuffing. Sometimes I make it on Thanksgiving day, but we are traveling to my mom’s this year, so we had our annual stuffed squash fall celebration this weekend. It has quite a few steps and takes a little longer than most of my recipes, but it’s totally worth it. To make a quicker but equally delicious version, you could roast pre-cut butternut squash and add it to the stuffing and just serve it in bowls. I used Field Roast Apple Sage sausage, Earth Balance, and veggie stock to make this an all vegan dish. Of course, you can sub these with any sausage, butter, or stock you have on hand. If you have any vegetarians dining with you for Thanksgiving, this dish will totally wow them and it makes a beautiful presentation all of your guests will love. A little note to you from us. We hope you have a wonderful Thanksgiving full of laughter and love and joy and happy tears and delicious food. We are incredibly grateful for each one of our readers and all the love and support you’ve shown us as we’ve opened up our kitchens and our lives to you this year. 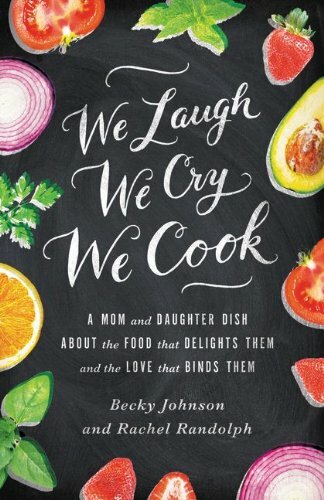 We’ll be thinking of you as we tie on our aprons and make a great big Thanksgiving feast (and a monumental mess of Becky’s kitchen) in Denver together. All the flavors of Thanksgiving in one beautiful bowl. Step 1. Preheat oven to 375 degrees. On a pan, toss bread cubes with olive oil, sage, garlic powder and oregano. Heat in oven until crispy and brown. Set aside to cool. 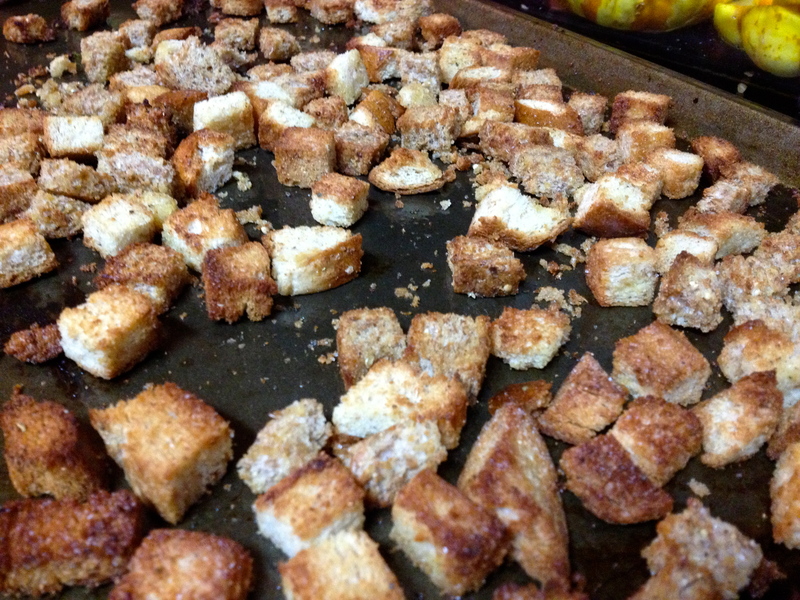 I used a mix of stale white bread and Ezekiel bread to make the croutons. Step 2. Carefully cut the squash in half to make two “bowls”. You can cut it around the middle or from the stem to the bottom (the easiest way), depending on the shape. If you just want two bigger servings instead of four small ones, you can even just slice the top off of the squash for a pretty bowl presentation. (Search “stuffed squash” on google images to see lots of presentation options.) 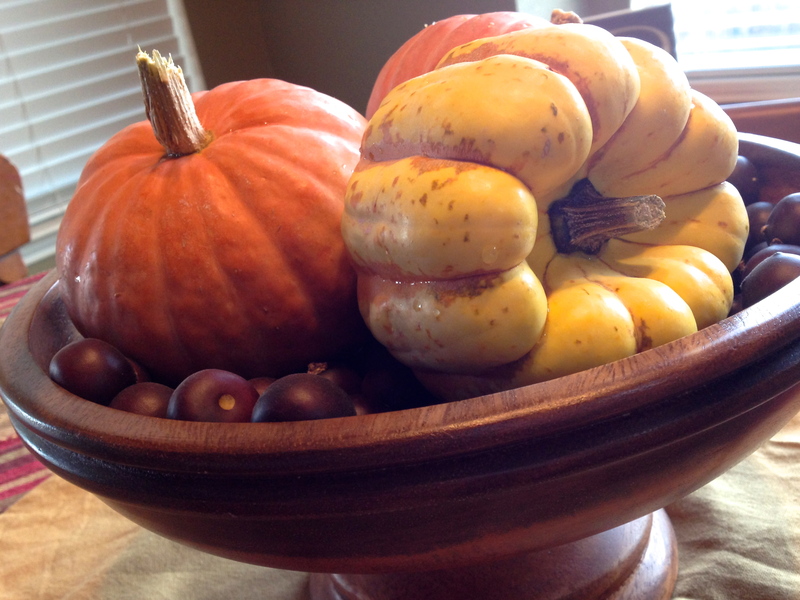 If needed, cut a little piece off of the bottom of your squash “bowl” to make a flat surface. Remove the seeds from the squash. (Save the seeds for later and bake them with a little Earth Balance and seasonings for an hour at 300 degrees for a delicious snack.) In a large baking dish, put all the halves cut side down and add about 1/2 inch of water. Bake for 30 minutes or until the squash is nice and tender (you should be able to easily slice through the flesh with a spoon). Step 3. While the squash is baking, heat a skillet to medium to medium high. Coat the bottom of the skillet with olive oil. Add sausage and brown on all sides, add more oil if it sticks to the pan. 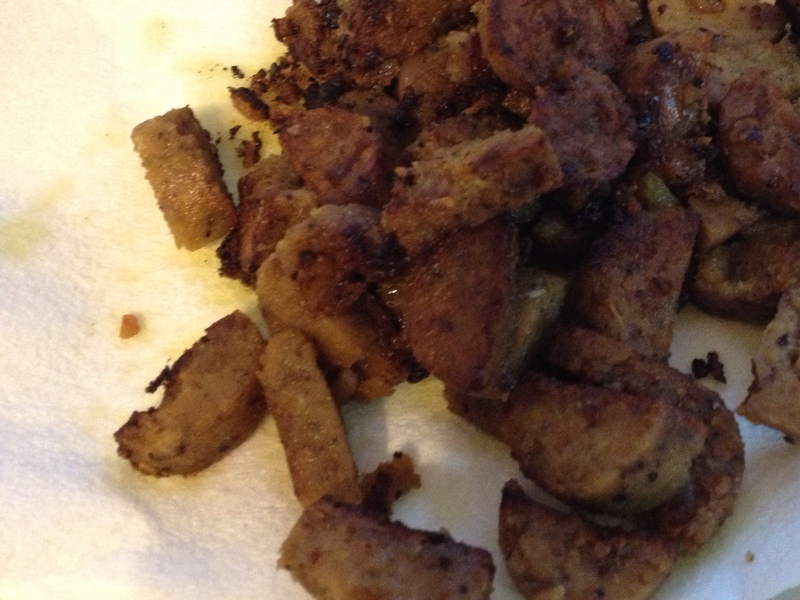 Set sausage aside on a paper towel lined plate. Field Roast Apple Sage sausage works beautifully in this dish. It is soy & gmo free and has passed the taste test with my omnivore friends. Step 4. In the same hot skillet, lower heat to medium and add a little more olive oil. Add the onions and celery and a pinch of salt. Stir occassionally until onions and celery are soft. Add the apples and kale. Saute until they are soft. Lower heat and stir in sausage, pecans, drained cranberries, clementine or orange juice, and season with salt and pepper. Remove from heat. 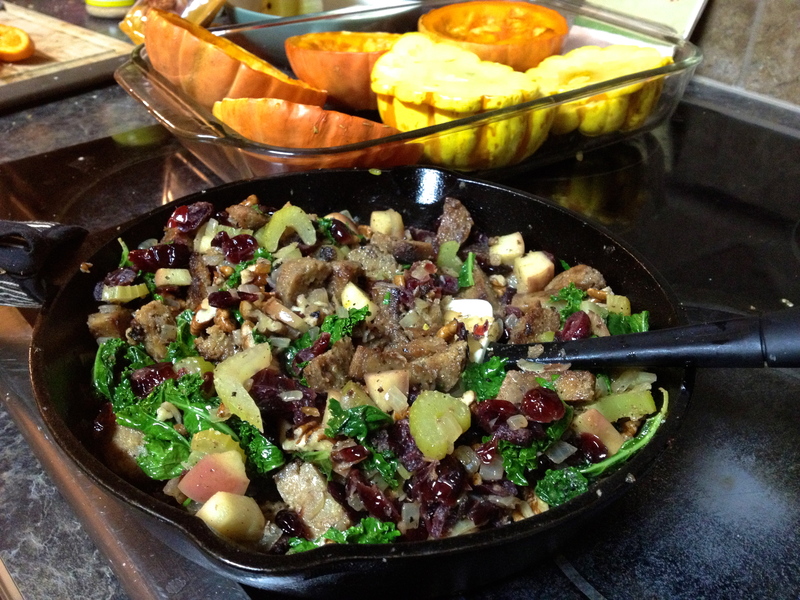 Onions, celery, apples, kale, pecans, craisins, and apple sage sausage. Mmmmm. Step 5. Drain the water from the squash pan and flip the squash cut side up. Put 1/2 a teaspoon of Earth Balance, butter or olive oil and a sprinkle of salt into each squash half. Step 6. In a large bowl, combine croutons, sausage veggie mixture, and veggie stock. Spoon mixture into each squash half, letting any extras fill in the bottom of the pan. 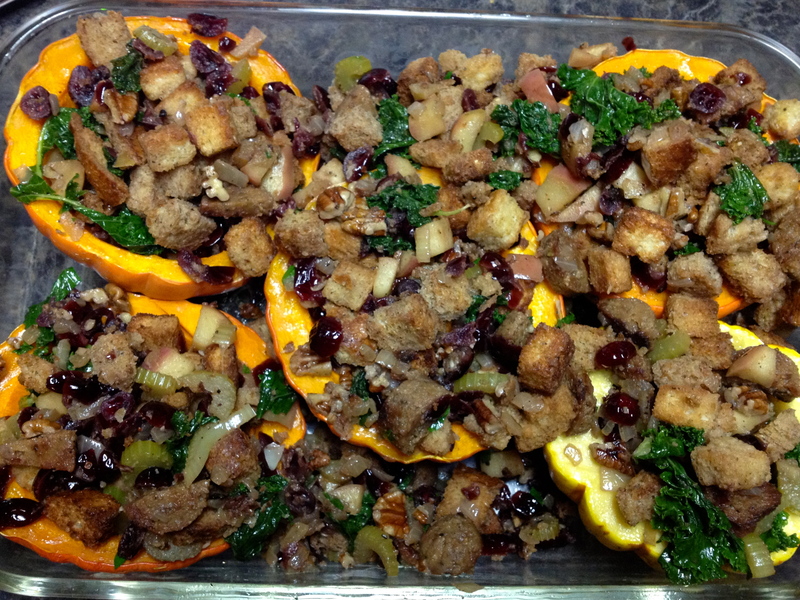 I used 2 1/2 squash, but the stuffing is really the best part, so I reduced the recipe to just 2 squash. 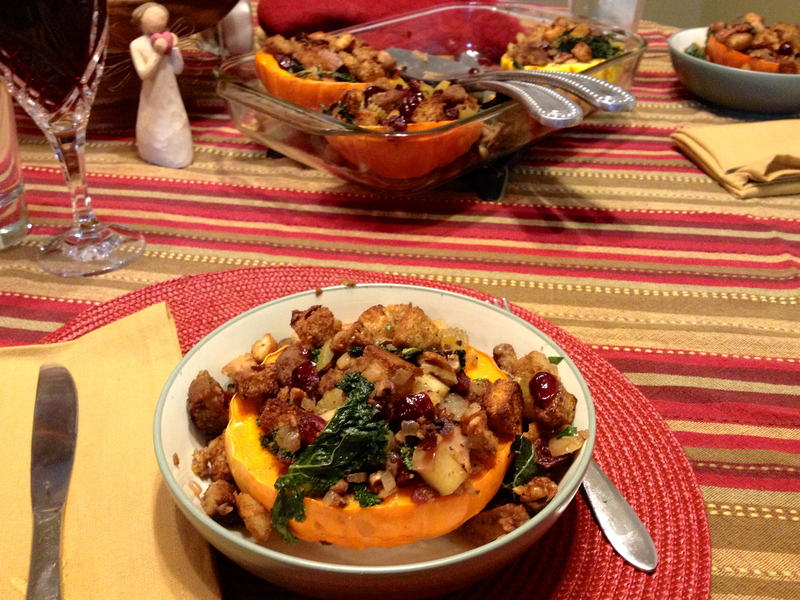 You and your guests will want to refill your squash bowls with a little extra stuffing. Trust me! Cover with foil and heat for 20 minutes. Remove the foil and heat for 10 more minutes. Serve with a heart of gratitude and thanksgiving.